Author Midnight KnitterPosted on June 21, 2017 June 23, 2017 Categories Cats, RosesTags cats, Knitting, roses, summer18 Comments on MacKenzie Speaks: Summer is here! FO Friday: June Socks, Joker Shawl and Roses! I’ve been working out in the garden all week except for when the afternoon thunderstorms roll in. Then it is knitting time! 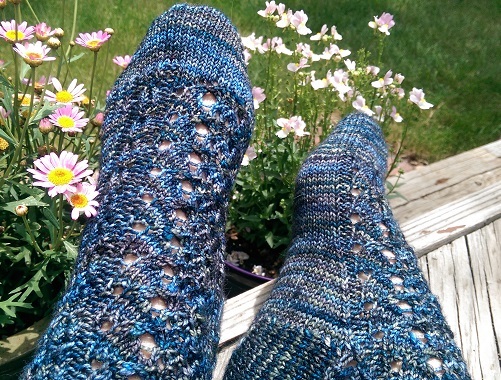 I worked on the June 2015 socks all week and got them done yesterday with a few days to spare. Ta-daa!!. These are the Petal Socks by Rachel Coopey. Here are the project notes on Ravelry. The colorway of this yarn is called “Thunder”. That turned out to be really appropriate as I knitted the socks to the sounds of thunder, rain, and even the tornado sirens one afternoon. I am really happy with these socks. The pattern come with complete charts for three different sizes. I made the medium size (66 stitches on size 1.5 needles) and they fit really well (which is something that I always worry a little about in a lace sock). I used double pointed needles in the leg portion of the sock, but switched to two 16″ cable needles as soon as the sock divided to make the heel and that made the lace panel on the top of the foot much easier to manage. The yarn (Becoming Art Cielo) was kind of elastic which I think helped. 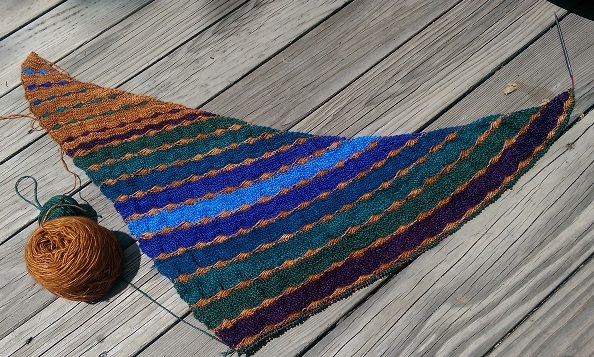 I’ve also been making some progress on my second Joker and the Thief shawl. I was not happy with the colors at one point, but I am liking it a little more now that the color pattern is easier to see. 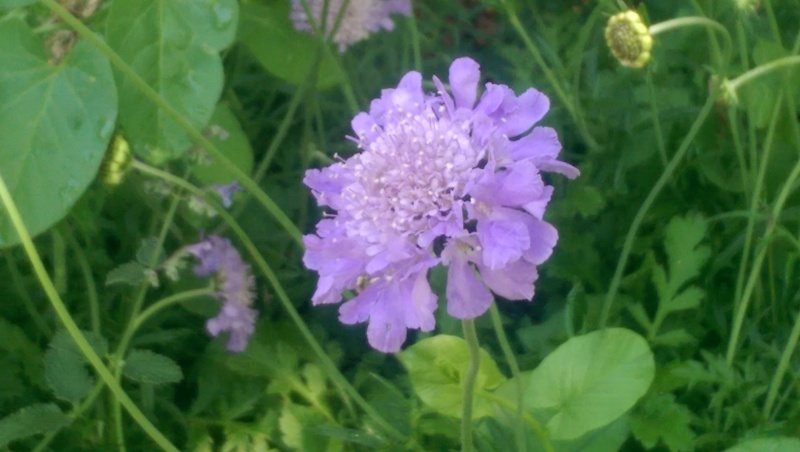 Look what happened in the garden with all of the rain this week! My Princess Alexandra of Kent rose is blooming! I just love this one. This rose sometimes struggles in the dry air of Colorado, but not this year! That it for the week. The clouds are really rolling in again for our afternoon soaking, so I think it’s time for me to fire up the knitting needles for the afternoon. Orange is the New Black, here I come! Author Midnight KnitterPosted on June 26, 2015 Categories Knitting, Roses, SocksTags Becoming Art Yarn, gardening, Knitting, Melanie Berg, Petal Socks, Princess Alexandra of Kent rose, Rachel Coopey, Shawls, Socks, The Joker and the Thief Shawl4 Comments on FO Friday: June Socks, Joker Shawl and Roses! Return to the Garden: Hello Slugs, I’m Back!! Summer heat has arrived, I’m feeling better, and it is definitely past time to attend to the needs of the garden. Yesterday I weeded out front in the shade of the morning and then mowed that lawn in the evening (well, I actually mowed only half of the lawn. A neighbor then arrived and took the mower away from me to finish things up. I love my neighbors!!) Look at what has been happening out front while I was engaged in an indoor scleroderma-induced slug-fest. 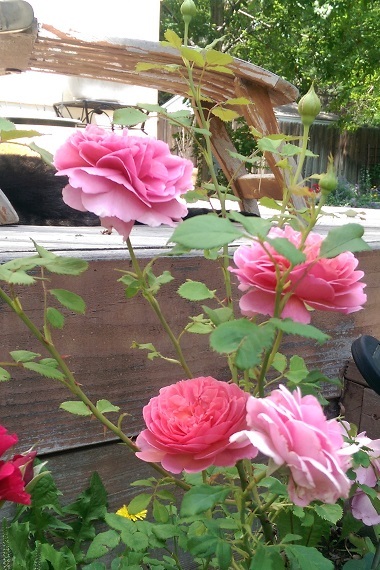 My new roses (Hot Cocoa) that I planted a couple of months ago burst into bloom! 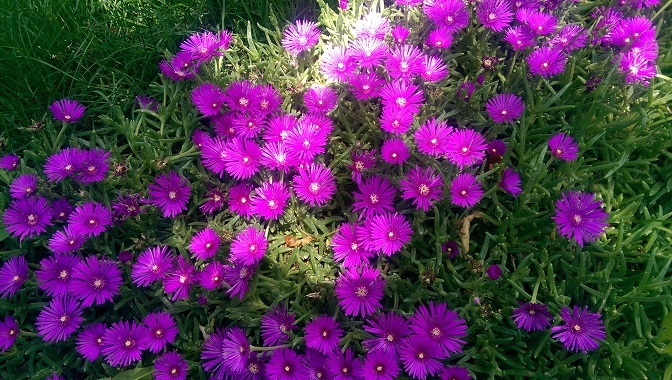 The ice plant that I planted along the front walk has also gone into overdrive. The color made me so happy I didn’t even mind pulling the weeds! 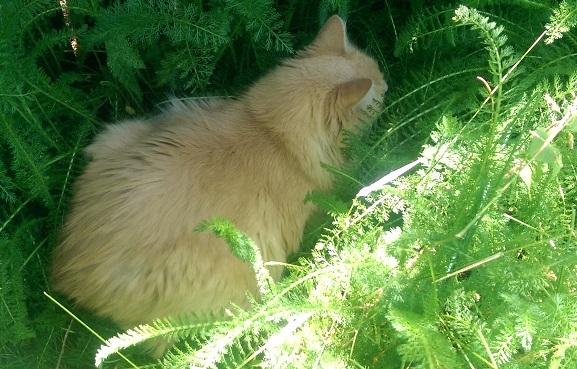 This morning I moved into the back yard with the cats to see what I could accomplish in a couple hours of coolness and shade before the afternoon heats up. 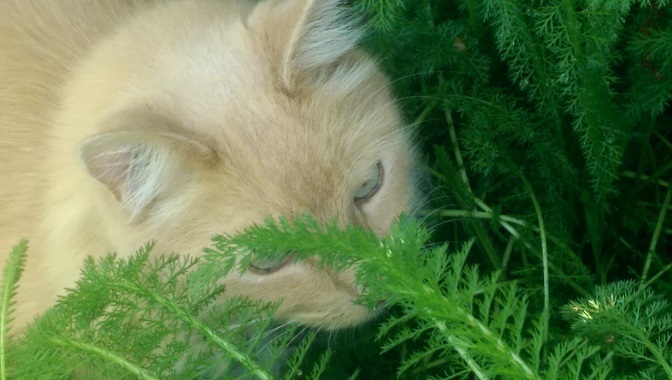 Oh dear, it is somewhat of a jungle, and the cats have been running wild. Guess I need to mow this lawn too. See how intently MacKenzie is looking upward? 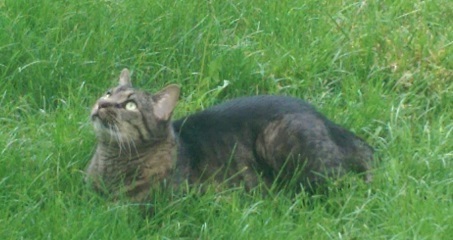 He’s watching the squirrel the cats had treed earlier this morning after chasing it all over the yard. 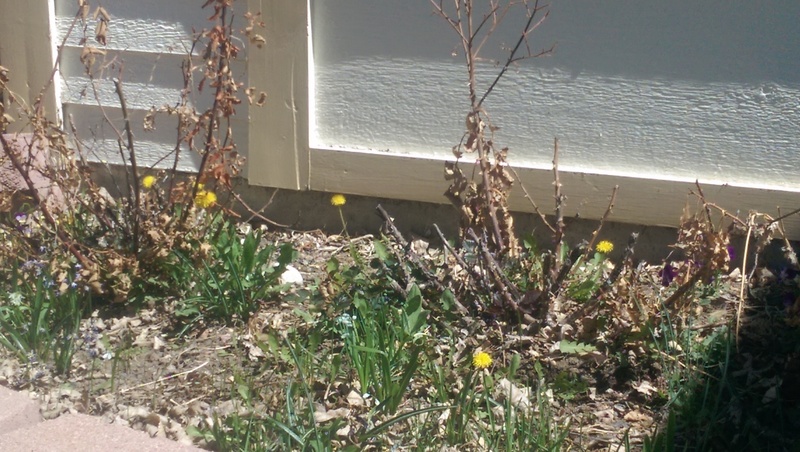 Yellow Boy has been busy building nests in several locations in the yard and the garden. Things are looking much better than I thought they would. I weeded like crazy, filled up two garbage sacks, and then planted some new flower seeds in one garden where a rose died over the winter. By then the day was heating up and I was starting to feel a little dizzy again. Time to head back into the house to rest up for afternoon knitting and lawn mowing later. The best part of the morning? I didn’t see a single slug!! 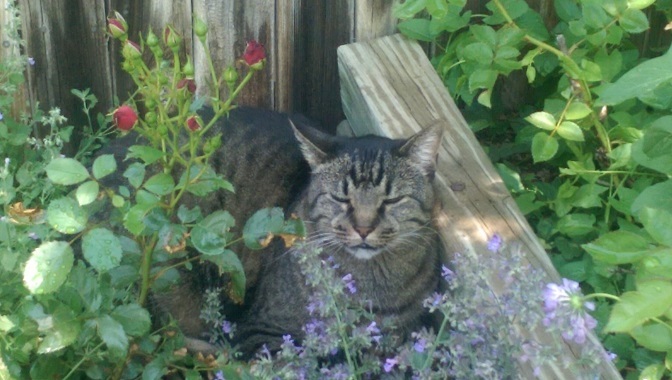 Author Midnight KnitterPosted on June 19, 2015 Categories Roses, SclerodermaTags cats, gardening, Hot Cocoa Roses, Knitting, roses, scleroderma, systemic sclerosis8 Comments on Return to the Garden: Hello Slugs, I’m Back!! On New Year’s Eve I made some resolutions. I’ve been keeping up with most of them, but there were a few that were one time deals that had to wait for the right time of the year. Now that spring is here it is time for me to address one of the big ones. The roses at the front of my house are just awful. 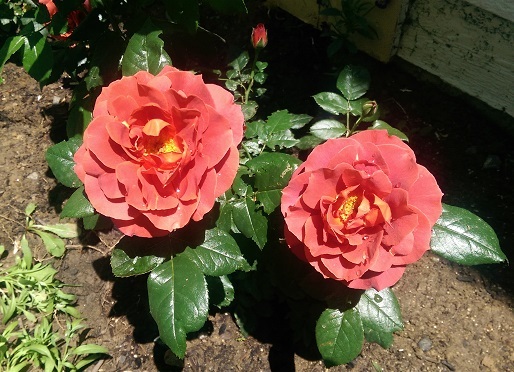 They were really nice roses for several years, and then they got a dose of bleach when my house was painted, and the extreme rainfall of the last two years was too much for them to handle. They struggled and what did manage to grow was munched by every passing insect. Ugh! Ugh! This is what the rose garden looks like now. 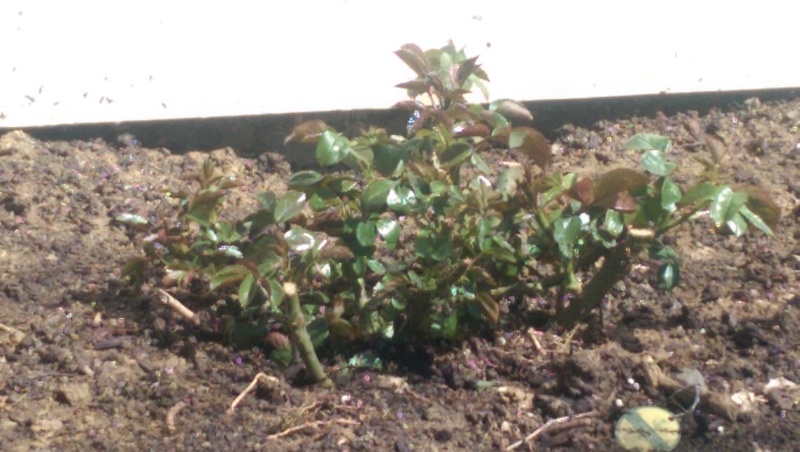 Sure, I can weed it and put in some bedding plants, but the roses just aren’t doing well anymore. Time for them to go! I have changed my landscaping around the house and had new rain gutter installed. 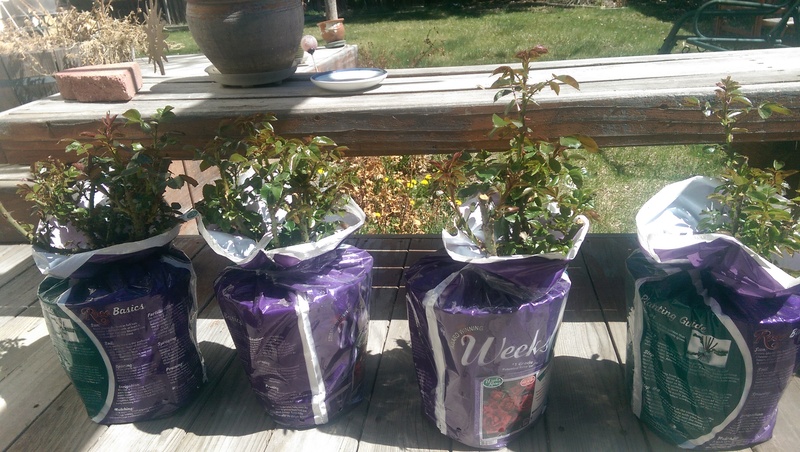 It is now time for me to rip these roses out and to replant them with some others that are hardy, full of blooms and resistant to insects. Off to my favorite nursery I went to look at roses. Here’s what I was looking for. My house is pointed a creamy white with gold trim. 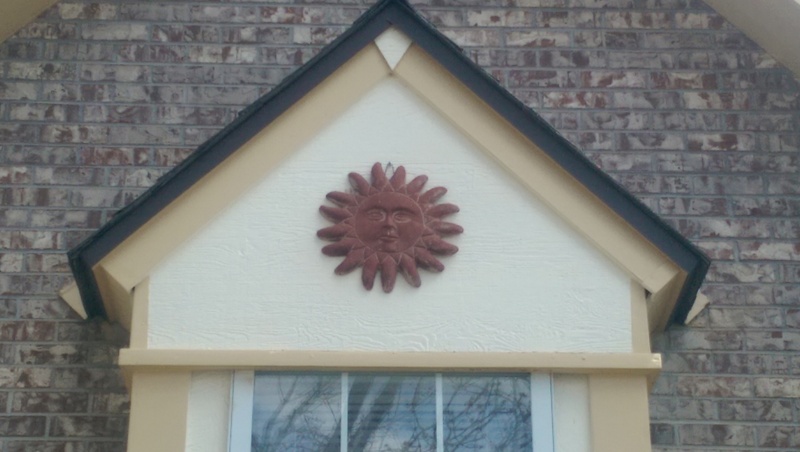 I have rust colored gingerbread trim and this happy sun above my kitchen window. I decided I wanted floribunda roses that were deep rusty orange. 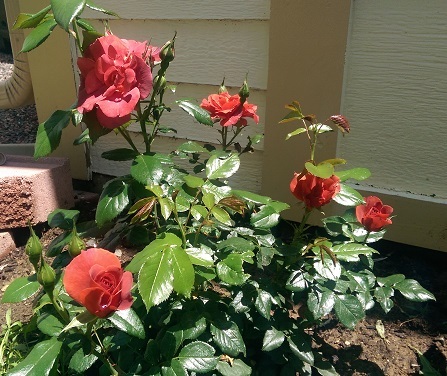 These roses are called Hot Cocoa and are hardy and disease resistant. I’m hoping that the insects won’t find them as tasty as the earlier roses. They should bloom for most of the summer and the flowers will be deep smoky orange. 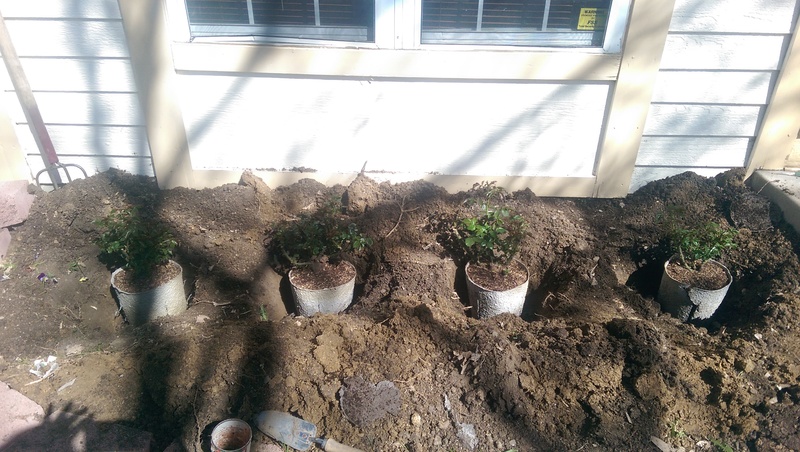 After 2 hours of digging and ruthless weeding, I finally got the new roses placed in the flower bed. Here’s one of the new plants in the ground after a good soaking. The graft point on the bushes are about 3 inches below the ground to help the plants survive our winters. The weather here in Colorado will be warm all week except for a couple of day of rain. These guys should have a nice week to make a good start. Welcome to your new home little guys! And don’t play nice with the grasshoppers! !